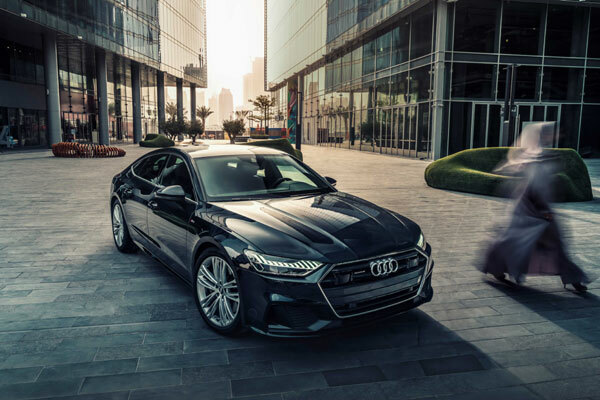 Audi, a leading automotive company, has launched the new A7 Sportback in the Middle East. The four-door coupe sets standards in the luxury class when it comes to progressiveness. It embodies a new style of Gran Turismo, with dynamic lines, systematic digitalisation, a sporty driving experience and a versatile space concept, said a statement from the company. The model combines the best of all worlds, it offers the design of a Coupé, the spaciousness of a Sedan and the variability of an Avant, it said. The interior concept of the vehicle impresses with more space and more comfortable seating. Compared with the previous model, interior length has increased 21 mm, resulting in more rear knee room. Rear passengers also enjoy more head room. The loading width has also increased compared with the previous model and now measures 1,050 mm. Topping the range of new seats are the multi-adjustable, customised contour front seats with ventilation and massage. The configuration with individual rear seats (alternative: 2+1 bench) offers plenty of space and comfort. New high-tech options make life with the Audi A7 Sportback even more comfortable and convenient. The air quality package improves interior air quality by means of fragrancing with subtle scents, an ionizer and an effective combination filter. The body, which features steel and aluminium composite construction with large components such as add-on parts made of aluminium, is a key factor in the improved handling and greater comfort. The four-door coupe scores top marks with respect to body stiffness, aeroacoustics and aerodynamics. The Gran Turismo spoils its passengers with improved acoustic comfort and – thanks to sophisticated aerodynamics – minimal wind noise. The progressive exterior design of the model is largely devoid of chrome. The paint range offers a choice of 15 colours, of which eight are new. The vehicle’s centre console is oriented toward the driver, underscoring the Gran Turismo’s sporty character. Four key values characterize the interior concept: progressiveness, sportiness, intuitiveness and sophistication. All colours, upholstery materials and inlays underscore the new aesthetic, from the base version to the design selection and the S line sport package. The Valcona leather comes in as a standard. The new model comes standard with the MMI radio; MMI navigation and MMI navigation plus are available as options. There is a choice of four sound systems. The top version, the Bang & Olufsen Advanced Sound System, also delivers fascinating 3D sound to the rear seats. The optional dynamic-all-wheel steering, the new electronic chassis program (ECP) – the central controller for the chassis – and the updated air suspension make it even more agile, nimble and comfortable. The A7 is thus the perfect Gran Turismo: dynamic and agile on twisty country roads, yet comfortable on long highway stretches. The top chassis-related innovation is dynamic-all-wheel steering. It combines direct, sporty steering response with unshakable stability, resolving the conflict of aims between agility and comfort. At low speed, they steer counter to the front wheels to further increase the agility of the big coupe when parking or driving in urban traffic, for example. This reduces the turning circle at full lock by 1.1 meters. At 60 km/h and above, the rear axle steers in the same direction to increase straight-line stability and facilitate lane changes.